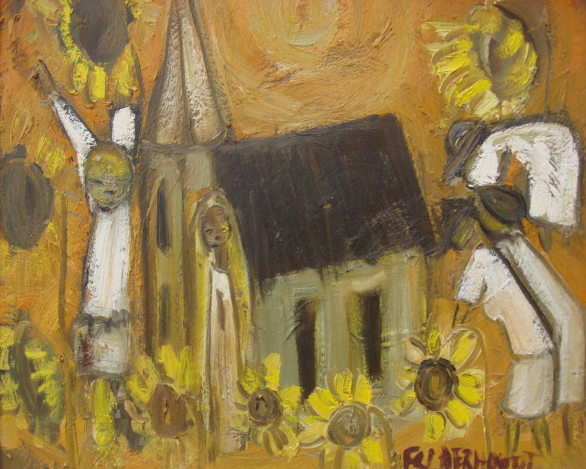 Father Frans Claerhout (1919–2006) was a Belgian Catholic missionary to South Africa as well as a self-taught artist whose painting sales helped support the church’s work in and around the impoverished towns of Bloemfontein and Thaba ‘Nchu. For him, painting was an extension of his mission, for through it, he said, he sought to communicate joy and beauty. 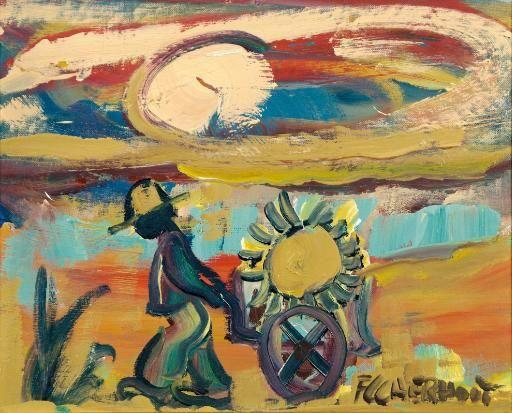 He often depicted the everyday scenes he observed around him—farmers harvesting grain, women carrying water or flowers, children playing, donkeys, chickens, sweethearts. Sometimes he transformed such scenes into biblical ones, such as the Annunciation, the Flight to Egypt, Peter’s denial, or the Good Shepherd. Claerhout understood himself as having a dual vocation. In a 1999 interview with Esté de Klerk, he said, “I am a priest, but I am also an artist, and I have always combined the two. I am one and the same, Father Claerhout—priest and painter. Not two sides of a piece of bread but the whole piece.” In other words, he saw the two as perfectly integrated. He couldn’t turn over his priestly duties for part of the day to focus on his art, nor vice versa, because they were one and the same. In both roles, he administered the gospel. 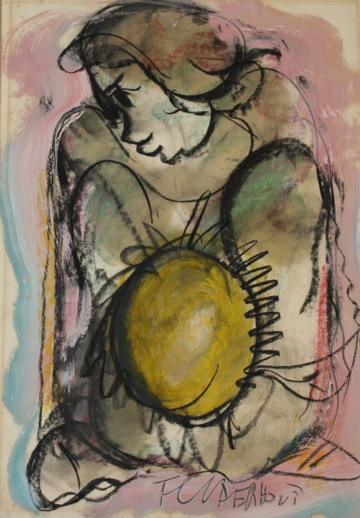 One recurrent motif in Claerhout’s work is what he called the “sun catcher” (sonnevanger): a person cradling the sun in his or her arms or toting it by hand or by cart. “Catching the sun” is a phrase that Claerhout used often in his teaching and poetry in reference to possessing joy—warmth, light—in Christ. Sunflowers also figure heavily into his oeuvre, an extension of the sun symbolism. I especially like the ones of the harvesters, reaping joy. I’ll spit the vulture from my throat. I no longer fear death. Claerhout’s ministry—in art and poetry, in preaching, and in service—was to point people to the sun and the Son so that they too could catch him and carry him wherever they went. 1. Frans Claerhout (Belgian/South African, 1919–2006), Boy and Cart. Oil on canvas laid down on board, 37 × 45 cm. 2. Frans Claerhout (Belgian/South African, 1919–2006), The Sun Catcher. 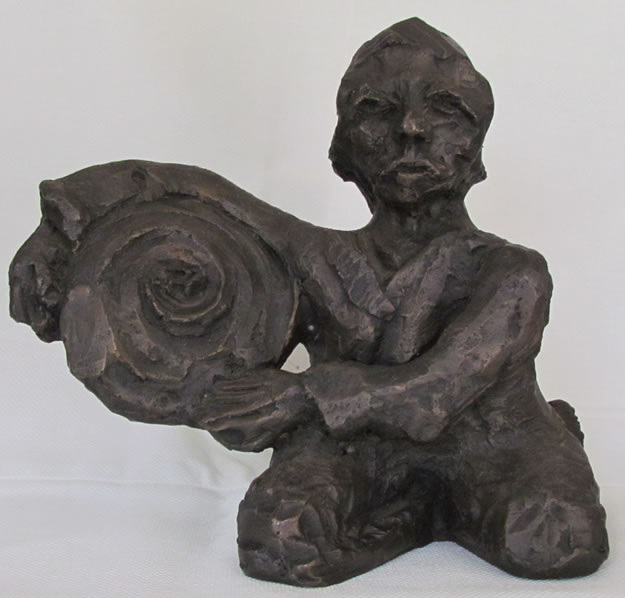 Bronze sculpture. 3. Frans Claerhout (Belgian/South African, 1919–2006), Woman with Sun. Mixed media on paper, 60 × 42 cm. 4. 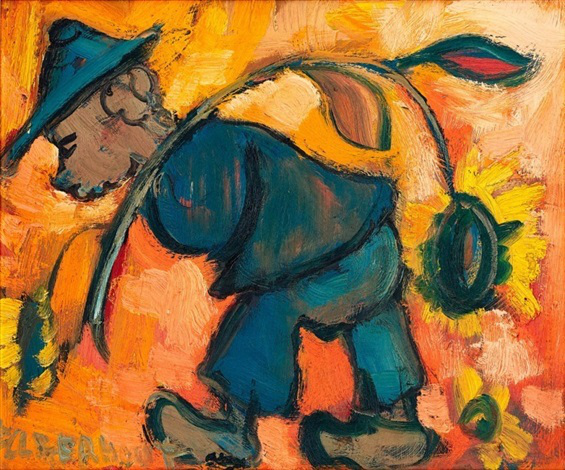 Frans Claerhout (Belgian/South African, 1919–2006), Man Carrying Sunflowers. Acrylic on asbestos, 149.5 × 120 cm. 5. 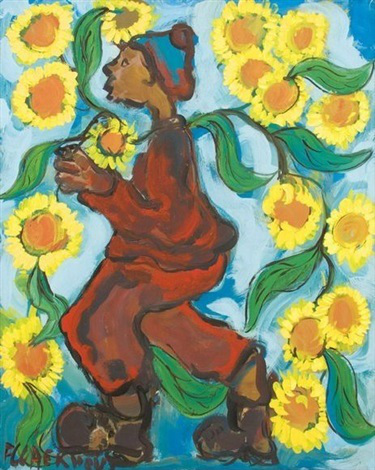 Frans Claerhout (Belgian/South African, 1919–2006), Man with Sunflowers. Oil on board, 49 × 59 cm. 6. Frans Claerhout (Belgian/South African, 1919–2006), Going to Church. Oil on board, 50 × 60 cm.